What follows is a list of books on Washington DC history (and biography) published in 2018. A Goodreads link is included for those available to provide more details on each title, the author, and book availability*. Roger C Aden, ed. et al. Rhetorics haunting the National Mall displaced and ephemeral public memories. Adam Costanzo – George Washington’s Washington : visions for the National Capital in the Early American Republic. Amanda Huron. Carving out the commons : tenant organizing and housing cooperatives in Washington DC. Robert James Kapsch. Building Washington : engineering and construction of the new Federal City, 1790-1840. Thomas Kenning – Abandoned Washington D. C.
Jonathan Riffe. Thomas Sweatt : inside the mind of DC’s most notorious arsonist. Tim Rowland. 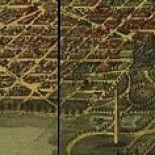 Strange and obscure stories of Washington, DC : little-known tales about our nation’s capital. Marko Ivan Rupnik; Michelle K Borras; Peter Škrlep; Tamino Petelinšek; Carl A Anderson. The space of communion : the mosaics of the Saint John Paul II National Shrine. John H Spiers. Smarter growth : activism and environmental policy in metropolitan Washington. Kenneth T Walsh. Ultimate insiders : White House photographers and how they shape history. Kimberly Prothro Williams. Lost farms and estates of Washington, D.C. This entry was posted on February 21, 2019 by dchistorystuff in books, Books of the year, DC History, Early Washington history, History, Washington DC history.